The ebb and flow of writing momentum breathes in life through your lungs like a parasite. Dictionary.com defines parasite as an organism that lives on or in an organism of another species, known as the host, from the body of which it obtains nutriment. I have the desire to write coursing through my veins. Due to that constant pulse, my heart is not my own. The space in my mind is allocated. My attention forever divided. I’m sharing my body with a fluxing current of energy; easily upset. This writing life behind my bones beats to the rhythm of its own drum. Sometimes it’s steady, marching me forward in what seems like the right direction. I can diligently work my magic balancing my day job… with my other day job and my life. It can speed up with excitement and I surprise myself with the accomplishments I reach. Then, without notice, without reason, without understanding why, it slows down to Chopin’s Piano Sonata No. 2. This is when I want to throw flowers and dirt. I want to bury away my writing and be okay with the me that’s left… mourning. But these days turn into tomorrows where the wind blows its secret language. An auspicious presence whispers every word of hope and encouragement I need. And, I’m back, finding the beat to march me onward once again. I’ve written before about the ups and downs of writing motivation and dealing with the dance of rejections and acceptances. I’ve posted pictures of Dory the surgeonfish from Finding Nemo to celebrate her motto, “Just keep swimming,” in hopes to spread perseverance. I know 100% that I must keep writing. But, I’ve also written about metacognition and as I sit here thinking about how I think about writing, I am suddenly very aware that I have become a host. Some days it’s a mosquito sucking every ounce of my blood. Other days I carry my swollen belly around with loving arms, caressing growing curves, and glowing with the wonder of new life. I fret about it often. I pray about it often. And I suppose for now, I am relieved my momentum does have a mind of its own, because sometimes I just need carried for a while… until I remember where I’ve been, where I am, and where I could go if I just keep moving forward. Just keep writing; it’s what the wind told me today. I take my students on “listening walks” where they quietly notice the world around them. We carry along a notepad and pencil. We don’t speak, but rather sing with our eyes. Let nature’s unspoken melody stir something inside. We listen to the rhythm of the wind, or the melody of the sun. 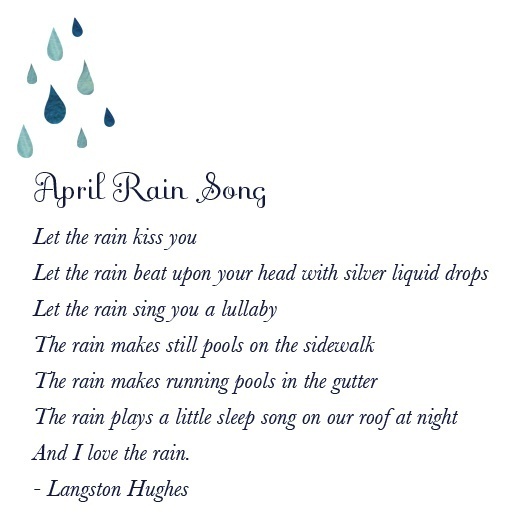 The beat of the rain… that reminds us to listen for its sleep-song, inspired by Langston Hughes’ April Rain Song. It may or may not lead to something you can use in your writing today or tomorrow, but I assure you the pause in your writing life to notice the world around in a quiet manner will benefit in a positive way. I find the writing process to be pretty mysterious. After I finish writing an essay, I’m kind of amazed that I did it, kind of amazed that the words came out.